Anna Tcybuleva, 25, from Russia, was awarded first prize at the Leeds International Piano Competition on 12 September 2015. She played a convincing reading of Brahms’s mighty Piano Concerto No 2. Tcybuleva receives a £20,000 cash prize, donated by the Liz and Terry Bramall Charitable Trust; the Daw Aung San Suu Kyi Gold Medal sponsored by Michael J Gee, Rowland J Gee and Nigel Gee of the Cecil Gee Charitable Trust and the Champs Hill Records Award enabling the winner to record her debut solo CD at the Music Room, Champs Hill. Second prize was awarded to Heejae Kim, 28 from South Korea, who played a thoughtful and crystal clear interpretation of Beethoven’s Fourth Concerto. Kim also won the Terence Judd-Hallé Orchestra Prize, in memory of a brilliant young pianist and past pupil of Dame Fanny Waterman. 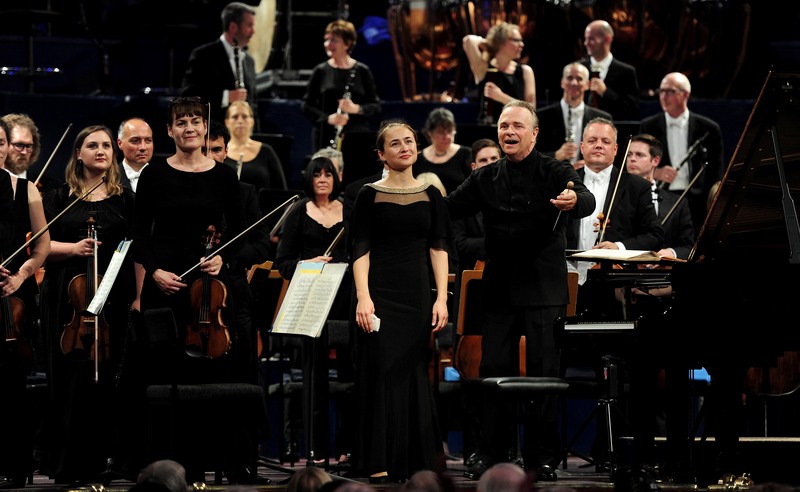 The prize is awarded by members of the Hallé and their music director Sir Mark Elder. The recipient receives a cash prize of £5,500, at least three paid engagements with The Hallé and an invitation to perform in the Manchester Mid-day Concerts series at Bridgewater Hall. Third prize was awarded to Vitaly Pisarenko, 28 from Russia, who played a rather frenzied, though exciting, Rachmaninov No 3. Fourth prize was awarded to Drew Petersen, 21 from the US, with a and thought-provoking Rachmaninov No 1. Fifth prize was awarded to Tomoki Kitamura, 24 from Japan, who played a lyrical rendition of the Schumann Piano Concerto. The sixth prize was awarded to Yun Wei, 21 from China, who also played Rachmaninov No 3 – and who gave us some beautiful moments, but sadly fell apart a bit in the last movement. We hope to see her return for the next Leeds Competition, when she’s all of 24! In addition to the prize money, the finalists are awarded a range of performance opportunities designed to enhance their international standing and develop their careers. Working in association with Wigmore Hall and the Sir Jack Lyons Charitable Trust, the finalists from this Competition and future Competition’s will be worked into the Wigmore concert schedule, offering a unique London recital platform to the most promising emerging talent. The series pays tribute to Dame Fanny Waterman’s outstanding contribution to the international musical life of Great Britain over the past 60 years. Engagements also include Steinway Prize-winner concerts, concerts with the City of Birmingham Symphony Orchestra, The Hallé, Royal Liverpool Philharmonic Orchestra & The Royal Philharmonic Orchestra. The jury comprised prominent pianists and musicians Nikolai Demidenko, Pascal Devoyon, Daniel Evans, Adam Gatehouse, Tong-Il Han, Jerome Lowenthal, Robert McDonald, Anne Queffélec, Marios Papadopoulos, Boris Petrushansky and Eleanor Wong – chaired by Leeds International Piano Competition’s own Dame Fanny Waterman. Dame Fanny (now 95) retires this year, and the prize-giving ceremony rightly focused on her extraordinary achievements and dedication. The Competition will now be run by Paul Lewis and Adam Gatehouse [see News story inside the new issue of Pianist] and there will surely be changes afoot for 2018. Dame Fanny’s legacy will surely be a hard act to follow. We wish Dame Fanny all the best for the future, and we look forward to the next Competition in 2018! Read a full-length article on the history of the Leeds International Piano Competition inside Pianist issue 85. Inside that same issue, you can read Erica Worth’s interview with Lang Lang, the Competition’s new Global Ambassador.